Facing a growing chorus of dissatisfaction from users, pundits, critics, and lawmakers, Facebook is reportedly holding an all hands meeting on to address the company's latest privacy backlash. It's unknown what the social network intends to discuss at its meeting, but the company may consider temporarily suspending its new Instant Personalization feature, according to All Facebook. The recent backlash and privacy concerns about Facebook began shortly after the company's F8 developer's conference in late April. During the conference's keynote speech, Facebook unveiled a variety of new user features, including the universal Like button and Instant Personalization, a feature that allows a Web site to cater to your personal tastes based on information from your Facebook profile. The social network also unveiled other features such as the Open Graph API and social plugins, all of which are meant to add a social dimension to your user experience as you visit sites outside of Facebook. When you visit a site like CNN.com, for example, the activity stream plugin can show you a list of actions your Facebook friends have taken on the site such as what articles they have liked or recommended. Less than a week after Facebook unveiled its new features at F8, four U.S. Senators--Senators Michael Bennet (D-Colo.), Mark Begich (D-Alaska), Al Franken (D-Minn.), and Charles Schumer (D-N.Y.)--asked the Federal Trade Comission to set privacy rules for online social networks. The four senators also sent a letter to Facebook CEO Mark Zuckerberg detailing their concerns with Facebook's expansion of publicly available data, the company's third-party data storage policies, and privacy concerns surrounding the Instant Personalization service. Then, in early May, the Electronic Privacy Information Center and 14 other public interest groups lodged a formal complaint against Facebook with the FTC. The goal is to "restore privacy settings that were previously available...give users meaningful control over personal information, and seek other appropriate injunctive and compensatory relief." There have also been several interesting reports on Facebook's expanding disclosure of user information. 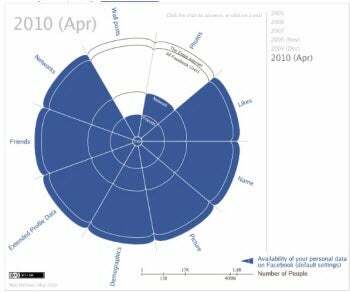 IBM researcher Matt McKeon posted an interactive graphic entitled "The Evolution of Privacy on Facebook," which shows how making user information public by default has progressed over time. The Electronic Frontier Foundation's Deeplinks Blog posted a timeline showing how Facebook's privacy policies have changed. Finally, on Thursday, The New York Times posted its own graphic called "Facebook Privacy: A Bewildering Tangle of Options" that says you need to click through "50 settings with more than 170 options" to fully manage your privacy on Facebook. Attempting to confront concerns over Facebook and privacy issues, several Facebook executives have made public statements in recent weeks. In an interview with Computerworld, Ethan Beard, director of Facebook's developer network defended Facebook, saying that user response to Facebook's expanded features had been "overwhelmingly positive." Several days later, responding to user questions in The New York Times, Elliot Schrage, vice president for public policy at Facebook, acknowledged user concerns over Facebook's recent changes, and said the social network intends to improve its "efforts to provide better guidance to those confused about how to control sharing and maintain privacy." Perhaps Thursday's all hands meeting is the beginning of Facebook's effort to improve user guidance on issues of sharing and privacy as Schrage mentioned, or maybe the company is considering a roll back of new features as All Facebook suggests. Regardless, it will be interesting to see if Facebook announces any changes to its new features in the coming days, as the network attempts to deal with recent criticisms over its new features and data sharing policies.